Weeks before he ever thought he would need a Pulmonary Rehabilitation program, Brethren Retirement Community’s ad for Inpatient Pulmonary Rehabilitation caught the attention of Martin McClure because he first spotted the photo of his former neighbor, Jennifer Bailey, RN and then the photo of his Pulmonologist, Dr. Quadri. Having a history of breathing problems, he read the article with interest, thinking if he ever had a need for that service, he was glad to know there was help in his community. Little did he know then that he would soon be participating in that program! Martin said he clearly remembers the night he smoked a cigarette outside and then suddenly could not breathe. Terrified and gasping for breath, he ended up in the Emergency Room and was transferred to Good Samaritan Hospital where his Pulmonologist practiced. As he improved, Dr Quadri talked to him about Inpatient Pulmonary Rehabilitation so he could be closely monitored in a program that was designed to improve his quality of life and help return home quicker and healthier. Martin said he remembered the ad and immediately said he wanted to go to Brethren Retirement Community for his Pulmonary Rehabilitation. Dr Quadri agreed. The inpatient pulmonary rehabilitation program at Brethren Retirement Community is individually tailored for patients with chronic lung disease or an illness that has affected breathing. The overall goals are to strengthen lung functionality, improve activities of daily living, and improve quality of life while reducing symptoms and re-hospitalization. Martin said at first he was very apprehensive about going to a nursing home because he is much younger than most of the residents and he really did not know what to expect but the program at Brethren Retirement Community is under the direction of his Pulmonologist, Dr Quadri, a Board Certified Pulmonologist, and has a Registered Respiratory Therapist and he knew he really needed the help to get better. He said, “It’s been a great experience and while it’s not home, it’s close. Everyone here has been wonderful! They are very, very nice and my room in great and very spacious and the meals are good!” He continued, “The therapists are really great and very protective of me, they monitor me very closely every step of the way. It’s comforting to know I have a respiratory therapist with me when I’m exercising who knows exactly how to help me improve my strength while improving my breathing. Knowing they are closely monitoring me really makes me feel safe. The therapists are so caring and not just interested in me as a patient; it’s very obvious they really care about me, and all the people in therapy, as individuals on a personal level and they show it. I appreciate that. 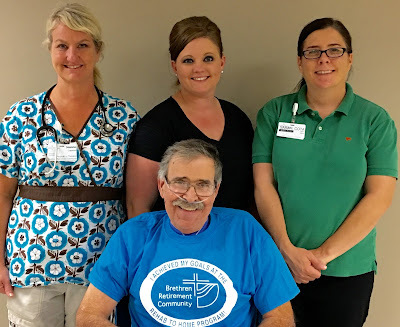 Joanne Crawford, Respiratory Therapist, said Martin worked hard in therapy and she worked with him on improving his breaths which enabled him to decrease the work of breathing and he was able to decrease his shortness of breath using diaphragmatic and pursed lip breathing. With help from Respiratory Therapy, Martin learned to control his breathing with any exertion including during his Activities of Daily Living. Martin was also educated about the various issues that can trigger his COPD. Additionally, he was educated on how smoking impacts his breathing and he decided to quit after a 40 year stent. The nicotine patch was provided to him to help him succeed. Martin has the comfort and security of knowing that Jennifer Bailey RN, our Nurse Navigator, has been following his progress every step of the way and will continue to monitor him for the first 30 days after he returns home to help him continue to improve and to prevent a re-hospitalization.